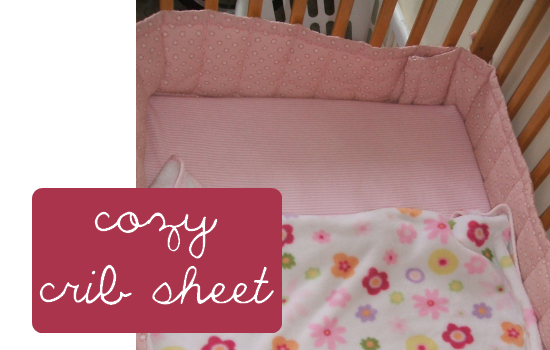 Cozy Crib Sheet Tutorial - Peek-a-Boo Pages - Patterns, Fabric & More! And… in our apt. sometimes it’s a bit cold inside too! So… I made little miss I cozy flannel crib sheet to keep her snuggly warm all night long. 1.Lay out your mattress (it’s a crib sheet in the pic. but a mattress would be best) on your piece of flannel. You need enough room on the short ends to cover the top of each mattress and the side. On the long ends you need enough to cover the top, the sides, and to wrap underneath about 6″. Finish your edges by folding under twice or serging. 2. Lay your flannel on top of the mattress and pin each corner in a straight line making sure the fabric is nice and snug. Previous Post: « The Crafty Moms Giveaway & 7 winners! The flannel is such a great idea! Thanks so much for this, I’ll be linking. I have an extra long crib and need to make my own sheets for it but have never done it. This looks simple enough. Thanks for the tutorial! I will be back to show you when I have completed them!! What a great idea. I may make 3 of those. My kids cant keep sheets on thier beds to save em.